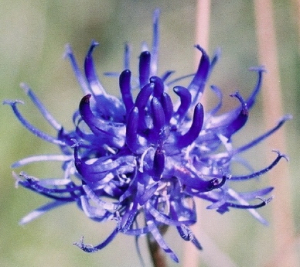 Observation - Round-headed Rampion - UK and Ireland. Description: Cluster in and around the chalk pit and in various areas of 'semi-rough' around the Merrow Downs Golf Couse - 400+ in all. Cluster in and around the chalk pit and in various areas of 'semi-rough' around the Merrow Downs Golf Couse - 400+ in all.